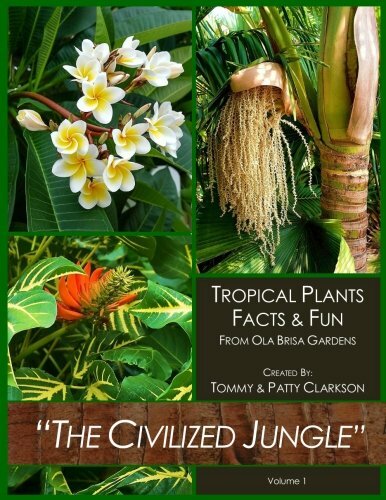 BOOK OVERVIEW A need has long existed for a book such as “The Civilized Jungle” Tropical Plants, Facts & Fun (Vol.1)”. It is written simply, explaining tropical plants in an uncomplicated and sometimes humorous manner. Tommy treats his plants with respect for what they are – living entities with a purpose for existence. Accordingly his descriptions are such that we all can fast and easily understand their physical wants, needs and individual “personalities”. These tropical plants, palms, trees, bushes, flowers, vines, succulents and more are presented – via descriptive “word pictures”, accompanied by photographs – in a way that allows us all to come to appreciate their individual, unique characteristics or – as Tommy says – their plant foibles! This is an easy – and fun – way to expand one’s awareness of some of Nature’s most spectacular creations – the vegetation of the tropics. Like his stories written in war-torn Iraq, he has striven to reach the soul of the subject and bare it to his readership. In approximately 750 words for each plant, Tommy has been able to capture the unique essence of each plant he describes, make it meaningful, appreciated and easy to apply by readers for their own use. If you have any questions about this product by Tommy Clarkson, contact us by completing and submitting the form below. If you are looking for a specif part number, please include it with your message.